I’ve been helping out a customer build a new MDT deployment environment and move away from Ghost and the 90’s. As they are not going to be implementing Systems Center Configuration Manager and SUP to automatically maintain their images offline any time soon, we need a way to keep their image up to date with updates, without having to re-build it every time. I knew you could already do offline servicing with DISM but wanted to make it nice and easy for them. I’m using WSUS Offline Update to download all of the updates in one shot, you could also use WUD but their lists haven’t been updated for a while. 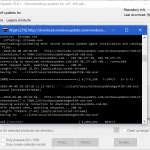 I copied the zip and extracted it to their deployment server and downloaded all of the updates for Windows 7 x64 SP1 and saved them all to a single updates folder. I then built up the below PowerShell script to offline service their image and apply the updates downloaded. If you have 100+ updates this process can take a while so sit back and drink a coffee while you run the script. Hope that helps.